Do you remember the small Icelandic village of Kirkjubæjarklaustur and the stories about mysterious disappearances and sinful nuns? The next Icelandic folktale can be found only 10 kilometers away. Welcome to the Dwarf Cliffs, this is Dverghamrar! Basalt columns are born when a volcano erupts and the hot lava flows cool off very suddenly. The basalt columns of Dverghamrar are believed to have formed at the end of the Ice Age, when the sea level was a lot higher than today. Stopped by cold sea water, the bubbling hot lava condensed and the surface of the formation started cracking. When this happens, the result is often hexagonal columns that attract tourists from all over the world. Funny enough, basalt columns don’t seem to be the most famous attractions in Iceland. For example the Giant’s Causeway in Northern Ireland is well known everywhere in the world. A lot better known than any of the columnar basalt formations in Iceland. I can honestly admit that we wouldn’t have had any idea of this amazing sight if our Stopover Buddy Anna hadn’t mentioned it to us. So thank you Anna, once again. Now it’s time for me to pay it forward and tell you about this wonderful nature formation in Southern Iceland. The story tells how Dverghamrar used to be (or perhaps it still is?) home to mystical creatures like elves and dwarfs. Hence the name Dverghamrar which translates as Dwarf Cliffs. 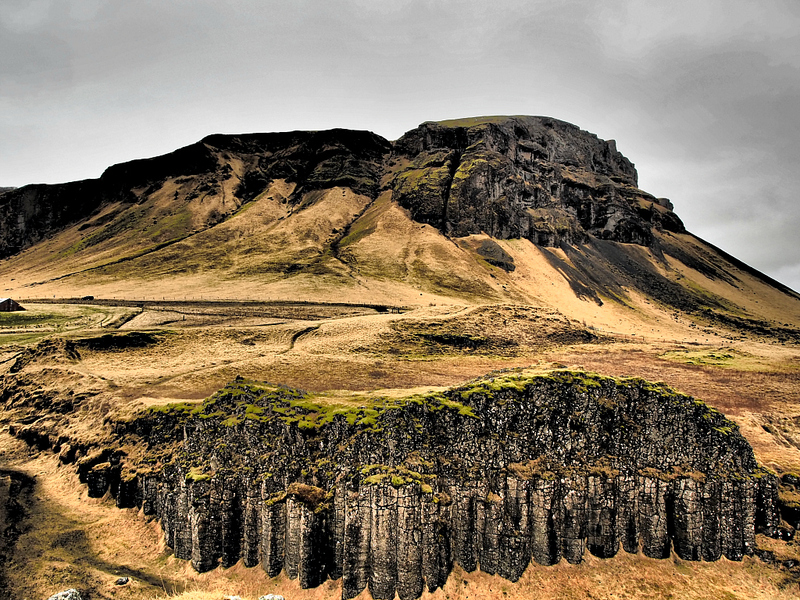 According to another Icelandic folktale, in 1904 a young girl living in a nearby farmhouse was walking near Dverghamrar, when she heard beautiful singing from the basalt columns. The girl looked around but couldn’t find anyone. The place was completely empty, but she kept hearing the singing even if no one was around. She kept listening until she was sure she has recognized the song. It was a Christian hymn about ‘The Father in Heaven’ and it followed her all the way home. And she still couldn’t see another living thing. The folktale states it was the dwarfs singing the song, and due to the choice of the song, Icelanders still believe today that dwarfs are Christian beings, ‘Light Elves’. The basalt columns of Dverghamrar are formed in two separate clusters. There’s a path in between them, and when you’re standing on the side of the ocean, you can see a beautiful waterfall called Foss á Siðu between the clusters. Ring Road goes between Dverghamrar and the waterfall. You can go to the other side of the road to admire the waterfall a bit nearer, but the private area is closed by gates, so you can’t get right next to it. The main thing you should know when visiting the basalt columns of Dverghamrar is this: go around both clusters. Go around the whole area. We ended up visiting Dverghamrar twice, because on the first time we missed the one thing that makes this place extremely special. In Dverghamrar you can find the Icelandic version of the Leaning Tower of Pisa. Even if it’s a lot lower than the actual tower in Italy. Have you ever visited Dwarf Cliffs or any other columnar basalt formations anywhere in the world? previous post: A Walk Through Naantali, The Sunniest Town In Finland!